Since Wednesday, China Eastern Airlines has sent seven planes to collect Chinese tourists stranded in Bali, Indonesia, after a volcano eruption. 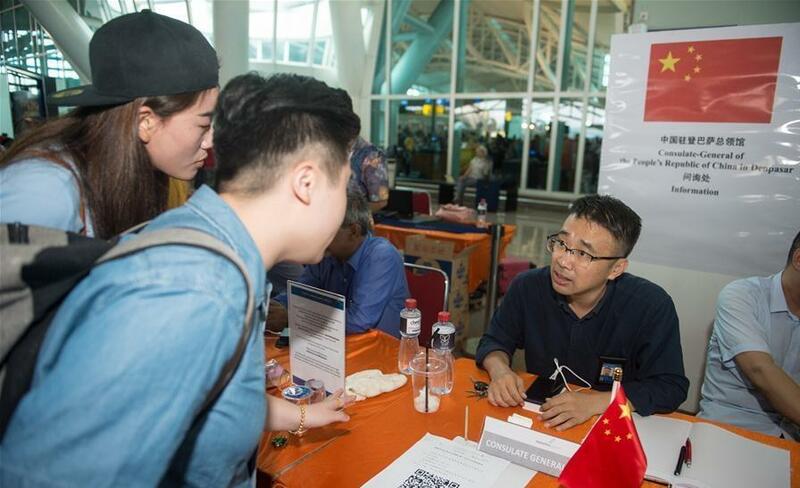 Chinese Tourists speak with staff members from China's consulate in Indonesia's Denpasar as they wait at the International Ngurah Rai airport in Bali, Indonesia, on Nov. 30, 2017. Since Wednesday, China Eastern Airlines, one of the country's major state-owned carriers, has sent seven planes to collect Chinese tourists stranded in Bali, Indonesia, after a volcano eruption. The airline estimated that more than 1,740 passengers will be returned to China. On Wednesday night, China Southern Airlines flew two planes from Guangzhou and Shenzhen, while China Eastern Airlines sent four from Beijing and Shanghai. Ngurah Rai International Airport in Bali was closed on Monday due to the eruption of Mount Agung volcano, stranding 17,000 Chinese tourists. The airport re-opened Wednesday afternoon and is subject to further closures depending on the weather and movement of volcanic ash.